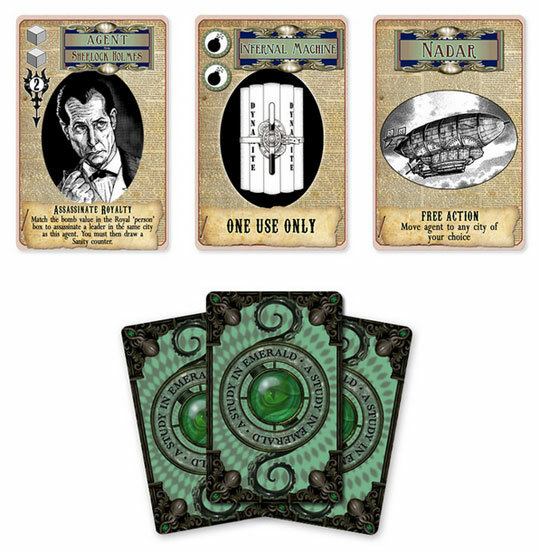 A Study in Emerald is a game for two to five players based on the award-winning short story of the same name by Neil Gaiman. In this stylistic mash-up of Sherlock Holmes and H.P. Lovecraft, the worst has already happened and the world is now ruled by the Old Ones. However, a secret war is being fought to free mankind from their servitude. The game A Study in Emerald fleshes out this core idea by including historical figures from the late nineteenth century, most being persons involved in the anarchist movement of the time. Deck-building forms the core of the game. You use influence cubes to bid for the right to draft cards and take control of cities. Each player has a secret identity, either a Restorationist fighting against the creatures or a Loyalist attempting to defend the status quo. Which side you are on determines what you score points for. An additional twist is that the performance of other players on the same side as you can stop you from winning if they are doing particularly badly, so you really want to know who is on which side. More specifically, when the game ends – and this can result from multiple causes, such as a marker on the War or Revolution track hitting 15 or the assassination of a Restorationist player agent – then the sides compare their scores; which side has the lowest score automatically loses, then the player with the highest score on the remaining team wins the game. This game has a lot going on and I’ll try to keep my review as focused as possible. This game is a love child by a a legendary author and a legendary game designer. Martin Wallace is responsible, amongst many games, for one of my favourites Diskworld:Ankh-Morpork and this game reminded me of it a lot with one major difference: it takes itself much more seriously this time. It is a wonderfully thematic and emerging experiance, though a little confusing at first on the rule side. Let’s begin to take it apart, step by step. There are several end game and win conditions and I won’t get in any detail here, but players recieve a secret agenda in the beggining of the game, and try to either assasinate enough Royalty figures, or hide them, thus saving them from being assasinated. Players bluff their way to victory assasinating and hiding, while a Revolution and War end-game tracks get filled up. There are also some special rules for assasinating opponent’s agents, which can result in game end as well. The theme makes this game so much fun! It is based on Neil Gaiman’s short story by the same name and it is every geek’s dream. It is a huge bag of Chtulhu mythos, mixed with zombies, vampires, Sherlock Holmes and historical figures. It might sound like too much and it probably will be for some people, but I personally enjoy all these things and find the combination delightful. Like most hevier games, once you wrap your head around everything it all clicks and starts to look simple. Before that point though, expect some confusion and scanning through the rulebook. There’s a Hidden Personality system with it’s own intricacies. There’s bidding-based deck building system. There’s Agents and Double Agent twist. There’s special rules for Vampires and Zombies. That being said, with an experianced player a 10-15 minutes of explanation and one or two turns of gameplay should be enough for anyone to get the basics. I’d say it is quick and streamlined. You recieve two actions that vary from moving your characters on the map, to geting new recources, to geting new cards, expanding your deck, to combat. Once you know what you’re doing turns pass quickly and everybody is having fun! There is just enough of it. Most of the time you’ll be focused on assasinating or protecting the Royalties on the map and buying new cards for your ever-expanding deck, but between these things you will block cards and locations other players need, bid just to screw with them and assasinate their guys. As I said, it has just the right amount. It’s appropriate, that’s for sure. It is at the same time classy and old-timey and comic-book style and cartoony. The cards are wonderful. They all represent cities, people and special events in a brilliant 19th century aesthetic. The board though is too candy-colored and cartoony for my taste. It is also kind of clustered. But it is still practical and I can’t complain too much. Also, the box is smaller than the average Ticket to ride style boxes, so there’s that. Just like in Diskworld (as I said these two games are similar in many ways) you’ve got many many combinations of cards – locations, agents and Permanent effects. Put your different agendas on top, and add the possibility of becoming a vampire and your options become endless. A Study in Emerald is a wonderfully thematic, deep and challenging board game that gives us all we love in a gothic horror story plus a lot more. It has very nice components and art and is just fun. It is priced a little higher than I’d like and the theme won’t appeal to people who are not into that gothic literature. That being said, I’d strongly recommend it for both horror/mystery/steampunk fans and board gamers who are looking for a deep and interesting experiance. I loved the game and I hope you will too. Gameplay is quite difficult to explain in detail, but the main point is that this is the best competitive/cooperative game i have found. Having only played one time and without the rulebook in my hands i will not enter the complex part of the game, but i will try you could take a glance at what astonished me. Yes i said this is a competitive/cooperative game. You will have a secret identity belonging to one of the two political groups confronted. You cannot show yourself unless that cause an end game condition (of course you can lie, and you must! ), so you have to play with your team trying to guess who is your mate and who is your enemy, at the same time you want your mates to know you are in their cause but you do not want your enemies to know for whom you are working. During the game there are different ways to earn victory points, and your actions can make you win inmediate VPs, or move certain situations that will come up to added victoy points for all the members of a team at the endgame. One nice mechanic is that your agent cannot be the target of an assasination until you have earn some personal VPs. At that moment you will be ‘known by the authorities’ and could be targeted, so plan carefully. The actions that give VPs are depending on your role, but while this is secret (so until the end of the game) you will be scoring all of them, no matter your side. This are so ‘fake’ VPs: when the game really ends all the players will come back to zero and calculate the REAL VPs they have win. – First totallize all the VPs for each player according to the team he is really playing on. – Now find who is the player with the lowest number of VPs: he, along with all (yes ALL) they party mates have lost the game. – The one in the other team with the highest VPs has won the game. Of course you could have some feeling of the victoy being on the wining side, but at the end only one guy is the real winner. I feel sad i will difficult have an opportunity to play again in a near future… So, if some of you have the chance to try it, do not lose it! It is the only game for now i have rated a 10. Add a Review for "A Study in Emerald"